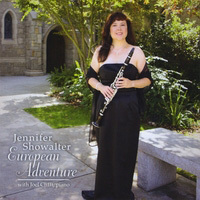 Jennifer Showalter is a versatile professional freelance clarinetist in Los Angeles, California. Her self-produced debut solo CD, European Adventure, was released in February of 2009 and has been featured on classical radio stations in the United States and Canada, and is featured in the current July/August issue of Fanfare magazine. Ms. Showalter has been principal clarinet of many symphony, opera, ballet, chamber, and musical theater orchestras and has performed with the Los Angeles Philharmonic, Long Beach Symphony, Pacific Symphony, Hollywood Bowl Orchestra, Santa Barbara Symphony, Long Beach Ballet, Asia America Symphony, California Philharmonic, Symphony in the Glen, Pasadena POPS, and the Santa Barbara Chamber Orchestra, as well as many regional orchestras . Ms. Showalter has performed with Civic Light Opera productions at the Ahmanson Theater, the Orange County Performing Arts Center, the Mark Taper Forum, the Schubert Theater, and the Thousand Oaks Civic Arts Plaza. For over a decade, she was seen as principal clarinet of the Hour of Power Orchestra, televised weekly worldwide from the world-renowned Crystal Cathedral, performing with guest artists such as Roger Williams, James Galway, Eugene Fodor, Gladys Knight and John Tesh. Active as a recording artist, she can be heard on numerous orchestral and chamber CDs and videos. As a soloist and chamber musician, Ms. Showalter has appeared with the Grammy Award-winning Southwest Chamber Music, the Long Beach Symphony Woodwind Quintet, the Los Angeles Philharmonic Woodwind Quintet, the North Wind Quintet, and the Lake Avenue Chamber Orchestra. She has also been featured in recital at the Brand Library, the Nixon Library, the Pasadena Library, Biola “Music at Noon”, and the “Goldline” series. In constant demand as a master teacher, Ms. Showalter is currently Adjunct Professor of Clarinet at Azusa Pacific University and a member of the APU Faculty Woodwind Quintet. Previously, she was on the Applied Faculty of California State University Long Beach, Biola University, Long Beach City College, and Pasadena City College. She is regularly engaged as an adjudicator and clinician, and was a member of the Pasadena Symphony Mentor and Tempo programs. Ms. Showalter's pre-college Clarinet Studio is widely renowned and her students have been members of various honor groups, many as principal clarinet, including the Pasadena Young Musician's Orchestra, Pasadena Youth Symphony Orchestra, Claremont Young Musician's Orchestra, Pacific Symphony Institute, Olympia Youth Orchestra, Los Angeles Youth Orchestra, California All-State Honor Band, SCSBOA All-Southern California Honor Bands and Orchestras, as well as winners of many solo and concerto competitions and scholarships. Ms. Showalter is a member of the American Federation of Musicians, the Recording Academy, International Clarinet Association, Music Teacher's Association of California, and the Southern California School Band and Orchestra Association.